Trailblazer Martin Riley, Tarmac's Senior VP, talks about how his own apprentice start inspired his passion for the area. He also discusses why he thinks apprenticeships in his area need to change, and why these changes could not have come at a better time for his sector. You began your career as an apprentice, has this motivated you to engage with apprenticeships now? As a teenager, if someone told me that I’d be running the same business I joined as an apprentice 30 years ago, I probably wouldn’t have believed them! Because of my own apprenticeship start I do have a personal commitment and real passion for them. I understand first hand how apprenticeship opportunities can build the foundations of a long term, fulfilling career path. How have you realised this commitment at Tarmac? Because of my experience I’ve always been 100% determined that we should be leaders in offering apprenticeships. And, as a result, we now have many examples within our business of talented, successful apprentices who are making their mark at Tarmac. From a variety of entry points, many have developed to take on management and leadership roles. "I firmly believe that apprenticeships are not only for young people, or those at the start of their career." What are some of the challenges you are facing in your bid to create new quality apprenticeships? Many of the frameworks available are only applicable to younger people, rather than those further on in their working life who are seeking to upskill or change career. I firmly believe that apprenticeships are not only for young people, or those at the start of their career. While bringing young people into our industry is key, I think it is also vitally important to also focus on providing opportunities for people to join and re-train, at all stages within their career. Apprenticeships must be open to people of all ages. I would say that two of the main challenges we face are creating training and apprenticeships that are really relevant to our industry, and to different entry points. "The UK’s ability to build houses, roads, hospitals, railways and schools depends upon having a plentiful supply of construction materials, and people suitably skilled to work with them." How important are the current developments being made, to your industry? 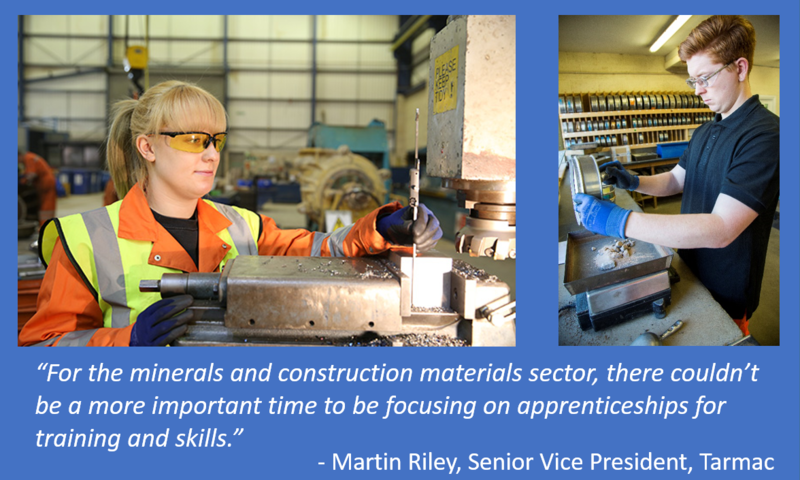 For the minerals and construction materials sector, there couldn’t be a more important time to be focusing on apprenticeships for training and skills. This industry faces a significant recruitment and skills shortage. In 2016, the Construction Industry Training Board said that 232,000 extra people are needed to deliver the UK’s infrastructure plans for the next five years. That’s enough to fill Wembley Stadium nearly three times over! The UK’s ability to build houses, roads, hospitals, railways and schools depends upon having a plentiful supply of construction materials, and people suitably skilled to work with them. After all, the average house typically uses around 200 tonnes of aggregate, and 12 tonnes of mortar, while a school will use around 15,000 tonnes of concrete. And there is no end of wider processes too, such as food manufacturing, water purification, pharmaceuticals, agriculture and steel manufacture, which rely on the aggregates that companies like Tarmac produce. So, you can see why it’s so important for us to recruit and train people in specialist roles - like quarry managers, drilling and blasting specialists, production managers and weighbridge supervisors - to help make these essential materials and support our domestic economy. How are you working on improving the new apprenticeship standards? Our aim is for the apprentices to be able to finish their training with a tailored skill-set that will enable them to really progress their career - in whichever field of expertise they’ve chosen to pursue. We are also looking to place a greater emphasis on the health and safety risks within our industry. How do you feel about working with the Institute? I see our partnership with the Institute as a really critical step in driving this sea change in apprenticeship standards for our industry. It’s a fabulous opportunity for us to work together on quality apprenticeship standards. I look forward to continuing our work with the Institute and helping to ensure apprentices of the future are given the same opportunities that I was afforded – in order that they might to grow and develop in this fascinating industry. If, like Tarmac, you would like to be apart of developing new apprenticeship standards, we’ve created a guide for employers to help. I could not agree more with Martin's comments. Meaningful apprenticeships are a godsend for people of all ages and from all walks of life. After all, you are getting paid to learn a trade, life and work skills. Not everyone is going to end up at the top like Martin but apprenticeships can give you the opportunity to make the best of what abilities you have, and to discover talents you didn't know you had. Well said Martin. I agree whole heartedly with your comments and hope that others will follow the example of Tarmac and yourself. Over recent years on the job learning apprenticeships have been neglected. It is the best way to give young and old the opportunity to learn and develop new skills. If industry would follow your example it would put the Great back into Great Britain again. I learned my management experience at Tarmac Roadstone after an engineering apprenticeship and this lead me to owning my own quarries, engineering and other companies. May you help many others to follow.